Be the first to share your favorite memory, photo or story of Very Rev. Fr. Leo. This memorial page is dedicated for family, friends and future generations to celebrate the life of their loved one. The Very Reverend Fr. Leonte Simion Copacia, Jr. of Shelby Township fell asleep in the Lord August 16, 2017. He was 85 years old. 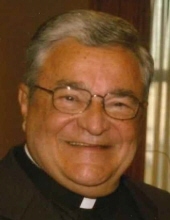 Known to many as Father Leo, he was born on April 4, 1932 in Salem, Ohio to Elena “Helen” (nee Buta) and Leonte Copacia, Sr., immigrants from Rosario de Sante Fe, Argentina and Beclean, Romania, respectively. An accomplished drummer, Leo became an Ohio State Rudimental Drumming Champion in 1947, and was awarded a three-year music scholarship to New York Military Academy. He graduated in 1950 with the rank of Cadet First Lieutenant. Afterwards, he attended The Ohio State University before enlisting in the United States Marine Corps at the end of the Korean War. Professionally, Leo held various management and executive positions at Chrysler Automotive, where he worked for 34 years before retiring in 1991. Leo completed the Late Lay Vocation Study Program for the Diaconate in Christ under the auspices of the Orthodox Church in America. He was ordained deacon on September 30, 1979, by His Eminence Archbishop Valerian D. Trifa, and served at Sts. Peter and Paul Romanian Orthodox Church and St. George Romanian Orthodox Cathedral in Southfield. Leo was ordained into the Holy Priesthood by His Eminence Archbishop Nathaniel on June 5, 1988, at St. Mary’s Cathedral in Cleveland, Ohio and assigned as Associate Priest to St. George Romanian Orthodox Cathedral in Southfield until 1993. In December, 1993, Fr. Leo was loaned as an associate priest to the Assumption Greek Orthodox Church in St. Clair Shores, Michigan where he served until April, 2001. On May 6, 2001, he was installed by His Eminence Archbishop Nathaniel as the first priest of the newly formed St. Raphael of Brooklyn, a mission parish in northwest Detroit. He was elevated to the rank of Archpriest by the Holy Synod of the Orthodox Church in America on March 20, 2007. Fr. Leo held many other religious positions throughout his clerical career. He was the national president of the American Romanian Orthodox Youth in 1960, and the business manager of the SOLIA Orthodox Diocesan Newspaper in 1963. He spent 16 years as the cantor and choir director at Sts. Peter and Paul Romanian Orthodox Church in Dearborn. He directed, produced and broadcast the English segment of the Orthodox Radio Hour, Station WNZK-690 AM which aired in the Detroit Metropolitan area from 1989 to 1994. He organized, planned and directed the First Council of Orthodox Christian Churches Christmas Concert of Orthodox Choirs in the Detroit Metropolitan area in 1987. He founded the Archbishop Nathaniel Charity Endowment Fund to help the needy. He served as Financial Adviser and Treasurer of the Romanian Orthodox Episcopate of America for three terms. In December 2003, he was appointed as Spiritual Advisor of the Association of the Romanian Orthodox Ladies Auxiliary of North America (ARFORA) for a one-year period. For health reasons Fr. Leo retired from the active priesthood on December 31, 2009. A beloved priest and devoted family man, Fr. Leo was deeply loved and will be sorely missed by all those who knew him. May God forgive him and give him rest. He is survived by his beloved wife of 62 years, Mary (nee Bogdan); his four sons, Terry (Suzanne) Copacia, Timothy (Linda) Copacia, Tod (Sharon) Copacia, and Trevor (Kimberly) Copacia; and his eleven grandchildren, Timothy (Nicole) Copacia, Ashley (Sean) Vandenbussche, Taylor (Megan) Copacia, Ryan (Lacey) Copacia, Cameron (Rochelle) Copacia, Leia Copacia, Christopher Copacia, Nicole Copacia, Alexa (Michael) Hatcher, Clint Copacia, and Bronson Copacia. He is also survived by five great-grandchildren, his brother, Frank Copacia (Molly) of Salem, Ohio, nephew Chad (Jessica) & family of Columbus, Ohio, niece Kristin Huckle (Jim) of Salem, Ohio, nephew Brad Schneider (Beth) & family of Greenville, SC and nephew Brent Schneider & family of St. Charles, IL. Fr. Leo was preceded in death by his sister, the late Helen D. Schneider. All visitation and services will take place at St. George Romanian Orthodox Cathedral, 18405 W. Nine Mile Road, Southfield. Visitation Monday 4-8pm with Saracusta 7pm. Divine Liturgy Tuesday 9:30am followed by Funeral at 11am and Luncheon at 12:30pm. Burial will take place in St. Mary’s Cemetery, Grass Lake. Memorial donations appreciated to St. George Romanian Orthodox Cathedral, 18405 West Nine Mile Road, Southfield, MI 48075 or to Vatra Generations, Romanian Orthodox Episcopate of America, P.O. Box 309, Grass Lake, MI 49240. "Email Address" would like to share the life celebration of Very Rev. Fr. Leo Copacia. Click on the "link" to go to share a favorite memory or leave a condolence message for the family.